With the Crankbrothers Klic HV Gauge Portable Bike Pump as your companion, you'll never be stranded on the road again. 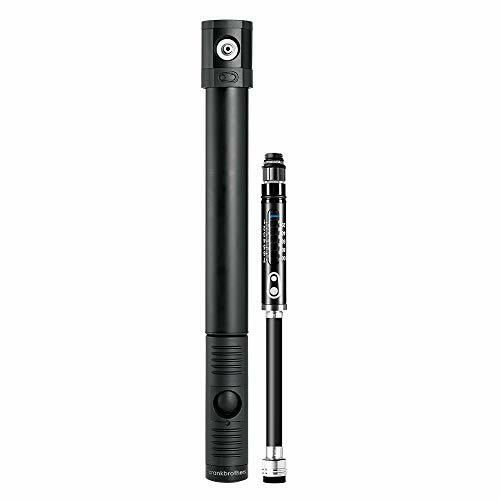 Ditch poor quality bike pumps for this reliable handheld tire inflator from Crankbrothers. For fast tire inflation, the Klic HV Gauge delivers 110psi of pressure. This high volume type pump is recommended for tires 1.8-inches wide and larger. The Klic HV Gauge's design incorporates a hidden magnetic hose for maximum compactness. This premium flexible rubber hose enables easy inflation. For broad compatibility and versatile functionality, the Klic HV Gauge Portable Bike Pump is equipped with a Presta/Schrader valve adapter. Easily alternate between the two to suit your desired configuration. If you have any questions about this product by Crank Brothers, contact us by completing and submitting the form below. If you are looking for a specif part number, please include it with your message.